Mirrors have a way of transforming the Apple Valley environment in which they sit. Take a small, poorly lit room and add in a few specific mirrors in strategic locations and the room seems to grow. Measure it if you’d like, but the room remains the same small room. What has changed is the way light reflects and that mirage-type response opens the room and transforms it into a pleasant place. In short, the mirrors changed the perception of the room. They revive the space so that it becomes pleasing to the people who use it. The frame on a mirror enables the mirror to incorporate other design elements such as style, color and texture, in Apple Valley homes. Framed mirrors can add richness such as seen in the foyer of a High Desert business. A large, heavy, gold, ornate mirror shows a sense of wealth and style. Put such a mirror next to the plastic framed mirror you find at the local department store and the second mirror looks sub-par. The mirror has not changed, just the frame. That is the power of adding a frame. Framed mirrors, however, are not appropriate in all settings. They become a tool of design for High Desert and Apple Valley homeowners. Where the mirror with the frame adds a heavy, realistic dose of old-time quality, a frameless mirror becomes a tool of modern design. One of the nicer features about frameless mirrors is that their use in design and decoration is greater than a framed unit. Mirror without frames can become an entire wall. They fit places in homes and bathrooms where water would destroy a frame. They come in various sizes from tiny to gigantic. The best feature is that the power of the mirror to transform remains strong. 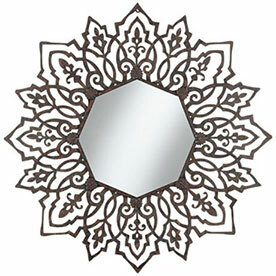 Framed or unframed, mirrors do not need to comply with the basic square or rectangle. Vern’s Glass can cut mirrors in a variety of shapes, such as circles or ovals. The idea of using a customized mirror shape allows High Desert homeowners to express their personalities while they enhance special spaces within their bathrooms or homes. Customized mirrors allow design themes to become center stage. Vern’s Glass offers specialized glass cutting, including mirrors. As part of serving the High Desert and Apple Valley, Vern’s Glass offers commercial and residential glass work, including complete window replacement, window repair, glass replacement, and glass repair. If you have a project that involves glass or mirrors, just call Vern’s Glass and put their expertise to work for you.